Twin Cities actor Jim Lichtscheidl is getting above-the-title marquee billing alongside Mark Rylance on London's West End. 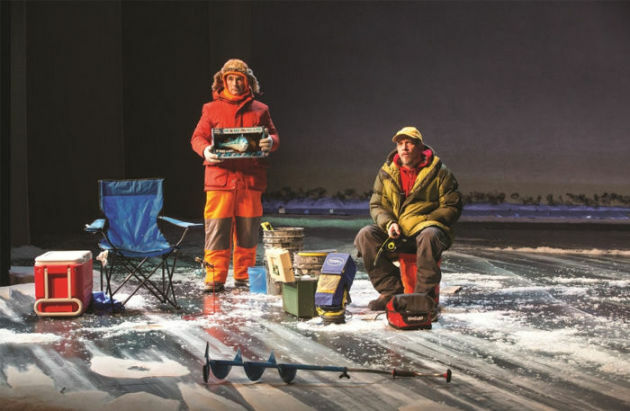 The two star in the London transfer of “Nice Fish,” a play about two ice fishermen on a Minnesota lake. Co-written by Rylance and Duluth prose poet Louis Jenkins, the play premiered in Minneapolis at the Guthrie Theater in 2013 before being reworked for a sold-out production earlier this year at St. Ann’s Warehouse in New York. The remount, directed by Claire Van Kampen, opened Friday at the Harold Pinter Theatre in London for a limited run that’s been extended through Feb. 11. Tickets are already hard to come by, and will become scarcer after the reviews sink in. The Independent called the production “bewitching and beautifully paced,” likening the show to a “Waiting for Godot” on ice. Rylance, a three-time Tony winner who nabbed an Oscar this year for his role in Steven Spielberg's "Bridge of Spies," has gotten universal praise for his portrayal of a novice ice fisherman from Wisconsin — not too big a stretch for the British actor, who spent nearly a decade of his youth in Milwaukee as a cheesehead cheering on the Green Bay Packers. But Lichtscheidl and the rest of the cast, including longtime Guthrie regulars Raye Birk and Bob Davis, have also received critical kudos. Under the headline “Mark Rylance reels them in with kooky comedy,” the Guardian said that Lichtscheidl “invests [his character] with an air of lugubrious melancholy.” The paper described Davis, who plays a DNR official, as an over-enthusiastic “bureaucratic jobsworth,” and singled out Birk for his performance as a spear-fishing grandfather. It also nodded to Jenkins' work as "playfully on-the-nose ... with an undertow of deep, yet lightly-borne melancholy." Actor Robert Dorfman, who recently appeared in “Sense and Sensibility” at the Guthrie, attended Friday’s opening to support Lichtscheidl, his partner.